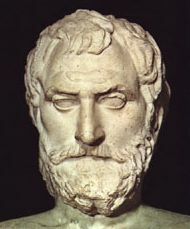 Thales of Miletus was a Greek philosopher. One of the first of his kind back in the days before Christ. He lived from around 634 BC to 546 BC. He was one of the Seven Wise Men of Ancient Greece and was on of the first scientists as well. He predicted the first eclipse in circa 590 BC and suggested that water was what every substance in the world was made from. In geometry, he discovered five of the theorems. He also used geometry to measure the distance from shore to ships at sea. One of the other things he did was measure the size of the Egyptian pyramids. Thales also introduced the idea that there was an explanation for everything (psysis which is the beginning of physics). This was a huge step forward from the old beliefs that supernatural forces were the cause of events in the world and lives of men. The coolest thing to me about Thales was that he started the concept of investing in futures. Olive oil was used back then for a great many uses. To prove that his wisdom could be useful and philosophers could make money, Thales made a deal with all the owners of the olive presses in his town of Miletus and in Chios as well. He agreed to rent them (with a discount to him for paying to rent them in advance of the need) during a certain time of the year (that Thales predicted would have a bumper crop of olives). When the olive crop came in, all the people who wanted them pressed had to pay him for the use of the presses he’d rented. He could set any price he wanted as he controlled them all. By virtue of this act, he became a wealthy man and proved that his knowledge could be useful. Pretty smart, yeah? For more, click here. or here. Wow, sounds like a Warren Buffet of his times. As usual I really enjoyed today’s Friday Facts. Thanks. I think he was def multi talented. Way cool. A thinker who can apply his knowledge to practical uses.